Depression affects as many as 1 in 5 people in the world (1). For such a widespread and serious disorder, the conventional understanding of what causes depression is dangerously incomplete. Depression is generally believed to result of low serotonin in the brain. "Poor genetics" or stressful upbringings are often blamed too. These play roles, but not nearly in the way we think. Conventional treatment of depression often includes Selective Serotonin Reuptake Inhibitors (SSRIs) such as Zoloft and Prozac. They work by helping serotonin work longer in the brain. While SSRIs can be helpful in the short-term, they can mask the problem and even create physiological dependence over the long-term. It is important to wean off SSRI's slowly because the body adapts to the drug. Going off SSRI's cold turkey is very problematic and can even be fatal. Discontinuation causes a sudden drop or imbalance of serotonin which may be linked with acute suicidal thoughts & extreme behavior. It's difficult to blame these instances on the drug because suicidal tendencies and depressive thoughts are why these individuals start the drugs in the first place. What happens if someone not only takes the drugs inconsistently, but also decides to stop or not refill a prescription suddenly after months or years of use? When you simply take a prescription drug to correct an "imbalance", it masks the problem at best. Making matters worse, as many as 30-40% of those treated do not respond favorably to medications (2; 3). While prescription drugs have their place, they were never intended as long-term solutions. Depression is not defined as a "SSRI-deficiency" - but that's how medicine often deals with it. "Why is the serotonin out of balance in the first place?". With the information we have now, you cannot talk about depression without talking about Gut Health and Inflammation. Irritable bowel syndrome (IBS) has been linked to depression. Over 80% of those with IBS report anxiety or depression (4). Some anti-depressant drugs have actually shown to improve IBS symptoms (5). IBS has been linked to overgrowth and imbalance of healthy flora in the gut (6; 7). The imbalance has been linked with changes in serotonin levels in the gut and brain (8). Leaky gut is when your intestinal lining allows you to absorb proteins, toxins, and wastes that otherwise would be digested, detoxified, or carried out as waste in the body. When these proteins, toxins and wastes are absorbed into the blood, they drive immune activation and inflammation which has been linked to depression (16). The brain also is protected by the blood-brain-barrier that can also become "leaky" just like the gut. When you have a leaky gut, you have a "leaky brain". The brain is susceptible to the insults despite normally being protected. A Danish prospective population study followed 145,217 individuals with depression and found that they had a 25% relative risk increase for a range of autoimmune diseases (17). Autoimmunity is inherently linked with leaky gut. When the body is concerned with proteins from food, toxins, and wastes - it can confuse them with healthy tissue including the brain and nervous system. Immune system "henchmen" known as T helper 17 (Th-17) cells cause collateral damage to healthy tissues and are responsible for true autoimmunity. Activating brain-specific immune cells called "microglia"
And, altering the balance of healthy gut microbes (18). While autoimmunity can be helped by a number of strategies, a great baseline strategy is to optimize vitamin D levels. Vitamin D is an anti-inflammatory and immune-modulating hormone that acts as a "referee" to keep things in the right balance. The microbiome has been the teacher's pet for researchers and clinicians alike over the last decade. The microbiome refers to the broad range of healthy bacteria or "flora" that line your entire digestive tract (but also may include microbes on the skin, vaginal tract, and more). These healthy bugs help us in a number of ways: digestion, tightening of leaky gut, immune signaling, hormone balance, and, yes, also brain control. Bacteria in the gut help with proper immune function of the central nervous system (19) and produce as much as 90% of the total serotonin in our body. 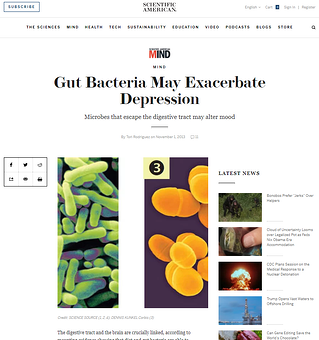 A number of studies have linked alterations in good and bad gut bacteria with depression (20; 21). The vagus nerve is the main nerve of your digestive system. It controls much of your "rest and digest" functions of the body. The vagus nerve is also a direct, two-way communication highway between the brain and the gut. Hormones, inflammatory messengers, and neurotransmitters like serotonin travel between the gut and brain via this Vagus nerve superhighway. You can strengthen your vagus nerve with a number of strategies like singing loudly, vigorous gargling a few times a day, deep breathing, cold showers, ice baths, and meditation practice to name a few. Not stressing your gut out in the first place with processed and allergenic food helps too! A number of vitamins, minerals, and amino acids are involved in depression pathways. They help to "grease the wheels" of chemical reactions throughout the body. They also serve as direct raw materials for the production of neurotransmitters, stress hormones and more. Most notably, the B-vitamins, including B12 and Folate have received much attention with depression. B12 and folate help reduce levels of an inflammatory marker known as homocysteine. High homocysteine is a risk factor for heart and vascular disease. Guess what part of the body contains the richest amount of delicate blood vessels? A healthy gut absorbs nutrients sufficiently to support brain health. 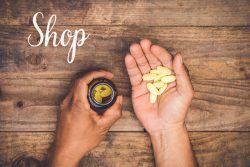 This means getting enough B-vitamins, L-tryptophan, L-tyrosine, L-glycine and a whole host of other vitamins and nutrients involved in the production of neurotransmitters in the brain - only achieved through a nutrient-dense, whole-food diet. You don't need a lot of referenced studies to understand that if your gut is constantly irritated, or if running to the bathroom takes over your daily life, or you associate eating food with bloating, constipation, pain or discomfort. It's not rocket science to understand that depression can result from coping with chronic disease, and gut problems are no exception. Much of difficulty coping is feeling powerless and not knowing what to try next. Stress is a potent trigger of gut problems. When you're body is on "fight or flight" alert all of the time, it cannot also be in "rest and digest"-mode either. So while I can emphasize dietary and supplemental strategies, sometimes cognitive behavioral therapy and other mental health techniques can help reroute the mental patterns that are necessary to heal in the first place. Gut health is interwoven with inflammation. Alterations in gut health are a primary source of inflammation. I've separated gut health and inflammation because inflammation doesn't have to come from the gut. The new accepted model of depression goes beyond the pharmaceutical-driven model of "chemical imbalances in the brain". Instead, the "cytokine model of depression" focuses on inflammation - which is at primary cause of imbalances in the first place (22). While a focus on inflammation (rather than brain chemicals) can sound like a subtle distinction, it opens the door to so many other treatment and management options for depression. C-Reactive Protein is a marker that's used by health professionals to measure inflammation. When CRP is high, it indicates that inflammation is coming from "somewhere" - and we need to dive deeper to find out where. Snuff out inflammation at its root causes - and you'll snuff out many of the root causes of depression! Inflammatory messengers known as cytokines are the immune system's way to communicate the right responses to the right areas. 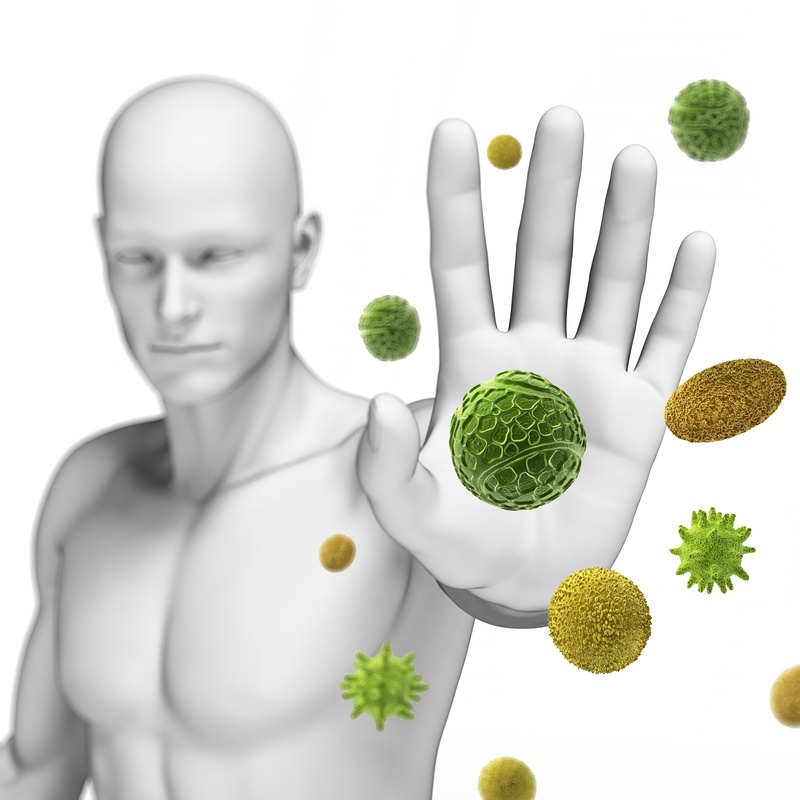 Cytokines help the immune system communicate with the body and brain. When over-stimulated, inflammatory cytokines inflict unwanted damage. The inflammatory cytokine TNF-alpha, for example, has been linked with every mechanism of depression and can drive down serotonin production in a number of ways (24). The conventional model of "low serotonin=depression, boost serotonin = treatment" is now viewed as incomplete, with the "cytokine model of depression" being more encompassing of the wide causes of depression (as well as low serotonin). If these little messengers called cytokines act as communicators between the immune system and body, what drives cytokines to be overactive? Chris Kresser, LAc reviewed the concept concisely in his article, complete with references: Is Depression a Disease - Or a Symptom of Inflammation?. To summarize: unhealthy diet, weight balance, gut health, stress, overexercise, sleep, alcohol, dental health, infection, and vitamin D deficiency all drive immune overactivation. Inflammation is a healthy and normal response by the body, but it's intended to be a short-term response, not a chronic overactivation. If you're allergic to a food, and you keep eating it, that's an inflammatory trigger that can lead to depression. If you have an underlying infection that has not been addressed, that's an underlying inflammatory trigger. If you're overweight, you are bathing your body in a sea of inflammatory chemicals every minute of every day. A multi-faceted approach to depression is necessary. The interplay between the gut, brain, and immune system is just too complex to just focus on one or two neurotransmitter pathways at a time. What makes inflammation tricky is that these changes do not happen overnight. It is over weeks, months and years that inflammation puts extra strain on the body that eventually can lead to disease and mood imbalance. You'd be surprised to know how quickly things can begin to turnaround over just a few weeks or months when these strategies are addressed - regardless of how long they took to develop. I want to broaden your understanding of infection. When you think about infection - you typically think of an acute problem like a cold, flu, or just an infected cut or scrape. Infection refers broadly to an overgrowth of a microbe that leads to a health problem. You don't have to have a fever, body aches, chills, or an acutely inflamed part of your body to have an "infection". There are other types of "stealth" infections that are very common and implicated in depression. For instance, when you have an imbalance of good and bad microbes in the gut, it is a form of "infection" on the body. Some viral infections can lie dormant and "reactivate" or smolder quietly for years. Epstein-Barr Virus, Herpes simplex I and II, Cytomegalovirus, Herpes zoster and others. Infections are linked to depression because they initiate inflammatory and immune responses by the body. If an infection lingers or is not completely quelled, it can drive gut dysfunction and inflammatory pathways leading to depression. The rut of depression can have your mind circling withon thoughts of inadequacy, lack of self-efficacy, low self-esteem, and a focus on "how things used to be". This is made worse when you combine a lack of treatment options to effectively deal with it - or a feeling that your only option is to "zombie out" on drugs that have their own host of side effects. The weight of depression is very real, I hope that this discussion offers new insights and hope that there are new strategies to bring back brighter days to you and those you love.